Identify this obstruction: Type A or B? 1 or 2? Knowing the difference between the two varieties of obstruction is one thing, but parsing the rules and making a definitive call in real-time separates a field of confusion from a ballpark of understanding. 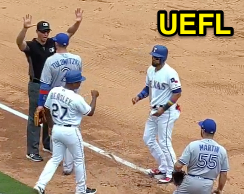 The Play: With one out and runners at the corners on Thursday afternoon in Arlington, Rangers batter Elvis Andrus hit a ground ball to Blue Jays third baseman Russell Martin, who seemingly trapped baserunner R3 Chirinos between third and home. As Martin ran Chirinos back to third, shortstop Tulowitzki shifted over and stood in front of the base, prepared to receive Martin's throw...only Martin opted not to throw to Tulowitzki, and instead dove at Chirinos, who, having collided with Tulowitzki, had not yet reached third base on his desperation lunge. 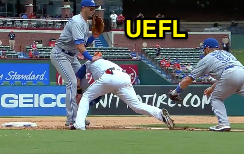 The Call and Mechanics: Nary a fortnight into his Major League umpiring career, 3B Umpire Shane Livensparger immediately identified Tulowitzki's obstruction by pointing to it as the two players continued to scramble on the ground. Livensparger's point was followed by a "safe" mechanic before the call-up umpire again pointed to the obstruction. As Tulowitzki approached Livensparger to discuss the call, Livensparger called "Time." The play approaches third base. 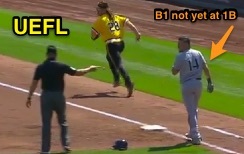 Analysis: Livensparger properly ruled Obstruction A, but improperly employed Type B mechanics to communicate the call. Let's break down the video (via "Read More"). 0:07: R3 Chirinos is obstructed by F6 Tulowitzki. This is an example of Obstruction Type A. 0:08: U3 Livensparger points to R3/F6 while the ball is live, an Obstruction Type B mechanic. 0:09: U3 Livensparger signals the runner "safe." If U3 is ruling that Chirinos beat Martin's tag back to his base, this is the proper mechanic for Type B Obstruction. If "safe" is part of his obstruction call, this is not a proper signal for either type of obstruction. Under both types of obstruction, play should be declared dead before awards are given. 0:13: U3 calls "Time" after the play ends. This cadence is an Obstruction Type B mechanic. U3 first calls "Time" after the play concludes. "Time" should be immediate in Obstruction A. Proper Mechanic, Obstruction A: When Type A obstruction occurs, the umpire shall (1) immediately call "Time" to kill the play, as, by rule, the ball is dead immediately when a runner whom a play is being made on is obstructed. After the ball has been declared dead, the umpire shall (2) laterally point to the obstruction and, then, (3) impose penalties as prescribed by rule (see below). Proper Mechanic, Obstruction B: When Type B obstruction occurs, the umpire shall (1) point to identify the infraction (laterally point and verbally declare "that's obstruction"), but keep the ball alive. When no further action is possible, the umpire shall (2) call "Time" to deaden the ball. When the ball is dead, the umpire shall (3) impose penalties as prescribed by rule (see below). Why not signal "Safe" in real-time? When an umpire signals "safe" while the ball is live, this generally means "the tag was missed/was late," "no violation," or "ball in play." 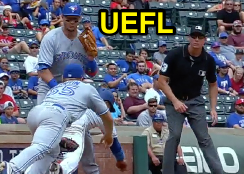 Other than during a tag play, a live ball "safe" signal when a runner collides with a fielder, such as Chirinos/Tulowitzki, would thus logically mean "no obstruction" and "no interference." It's another way of saying "that's nothing," which is quite literally the opposite of what U3 intended to call on this play. Signaling a runner "safe" on the tag is skipping a step or two of the obstruction cadence, and gives the umpire a misleading appearance of calling a runner safe who is clearly tagged with the ball while off base. Angel Hernandez signals Obstruction Type 2. Major Penalty Difference, A and B: Simply put, the obstructed runner in Type A obstruction is awarded at least one base beyond the base last legally touched at the time of obstruction. 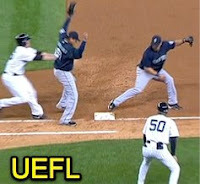 In a rundown situation, that means the runner gets at least the next base (if a thrown ball is in the air when OBS A occurs, and the ball subsequently goes out of play, e.g., the runner would get a standard two-base award). Other runners get "nullify the act" treatment unless forced to advance because of the obstructed runner's award. In Type B obstruction, all runners—including the obstructed runner and all other baserunners—get the "nullify the act" treatment. Because the ball is kept alive, this means that one or more of these runners may be declared out if they are tagged during the continuation of play. Obstruction 2 does not guarantee a free base (BRD: In NFHS/high school, the penalty for any obstruction [except catcher's obstruction on the batter] is an automatic one-base guarantee for the obstructed runner [nullify-the-act for everyone else]. NCAA/college carries the same penalties as OBR A and B). Silver Lining: If you're going to use the wrong type of obstruction mechanic, it's much better to use Type B mechanics for a Type A call than to improperly call "Time" and incorrectly kill the play, as one would for Type A, during a Type B obstruction situation when the ball should be left alive. Of course, it's better to actually use Type A mechanics for a Type A play. U1 uses the improper Type B point for A OBS. In 2016, Brian Gorman's crew employed improper mechanics on a Type 1 Obstruction play (the crew improperly kept play alive through the obstruction and until no further play was possible, as in OBS 2), but ultimately enforced the proper penalty of awarding the obstructed runner one base while placing a second baserunner at the base the crew believed he would have achieved had there been no obstruction ("nullify the act"). The Gorman crew's ruling resulted in the ejection of Brewers Manager Craig Counsell. Obstruction A on a batter-runner. Related Plays: In 2014, HP Umpire Greg Gibson ruled Obstruction A on a batted ball to the pitcher when the pitcher and first baseman converged on the ball while the batter-runner attempted to run by the two fielders. During that play, Gibson first (1) called "Time" (as mirrored by 1B Umpire Phil Cuzzi) before (2) laterally pointing to the obstruction and (3) awarding the batter first base. In 2011, Jerry Layne's crew convened to rule Obstruction A on an infield ground ball where the batter-runner ran into a non-fielding pitcher standing in his base path in front of first base. Though the plate umpire was Layne and first base umpire Alan Porter, it was 2B Umpire Hunter Wendelstedt who ended up explaining the call to a dissatisfied Mariners Manager in Eric Wedge. No obstruction appeared to have been initially called on the play—either that or the mechanics were not present. During the 2013 World Series, Jim Joyce and Dana DeMuth combined to make one of the most famous obstruction calls in Major League history. Joyce signaled Obstruction Type B as a baserunner and third baseman became entangled, allowing the baserunner to score the game's winning run as DeMuth enforced the OBS B penalty, making history as the first World Series game to end on an obstruction or interference error. Yes, DeMuth's mechanic should have been to call "Time" before imposing the penalty, but given the circumstance, his call was still clear. Bellino clearly conveys his Obstruction B call. In 2010, young fill-in umpire Dan Bellino called Type B obstruction during a Reds-Nationals game, ejecting Nats Manager Jim Riggleman for arguing his ruling. Bellino's mechanics provided a perfect example for calling this brand of Obstruction B. He pointed to the infraction when it happened (presumably, while verbalizing "that's obstruction"), but allowed play to continue. When the runner was eventually tagged while off his base, and the play thus concluded, Bellino did not indicate the runner safe, but instead (1) called "Time" and then (2) pointed back to the obstruction before (3) pointing to the awarded base and finally signaling the runner safe, in that order. Although Washington argued the call, there was no confusion or mistaking what Bellino's ruling was. Bellino was hired to the full-time staff during the ensuing off-season. Knowing the key differences between Obstruction Types A and B and employing the mechanics appropriate for the type of obstruction which occurs is a simple way to establish a high level of credibility and respect on the field if and when such plays arise. Proper mechanics in these potentially confusing situations communicate to everyone that the umpire is in command, is well equipped to handle the play, and knows the rules. By contrast, as the aforementioned incorrect mechanic examples demonstrate, failure to exercise the proper mechanic for the specific type of obstruction that occurs is a fast track toward a similar loss of credibility and control. [Definition of Terms]: "OBSTRUCTION is the act of a fielder who, while not in possession of the ball and not in the act of fielding the ball, impedes the progress of any runner." Obstruction A: Play made on the runner. 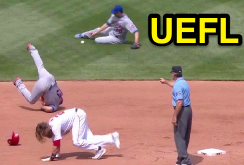 Rule 6.01(h)(1) [formerly 7.06(a), aka Type 1 or Type A]: "If a play is being made on the obstructed runner, or if the batter-runner is obstructed before he touches first base, the ball is dead and all runners shall advance, without liability to be put out, to the bases they would have reached, in the umpire’s judgment, if there had been no obstruction. The obstructed runner shall be awarded at least one base beyond the base he had last legally touched before the obstruction. Any preceding runners, forced to advance by the award of bases as the penalty for obstruction, shall advance without liability to be put out." Obstruction B: No play on the runner. Rule 6.01(h)(1) Comment (relative to mechanics): "When a play is being made on an obstructed runner, the umpire shall signal obstruction in the same manner that he calls 'Time,' with both hands overhead." Rule 6.02(h)(2) [formerly 7.06(b), aka Type 2 or Type B]: "If no play is being made on the obstructed runner, the play shall proceed until no further action is possible. The umpire shall then call 'Time' and impose such penalties, if any, as in his judgment will nullify the act of obstruction."